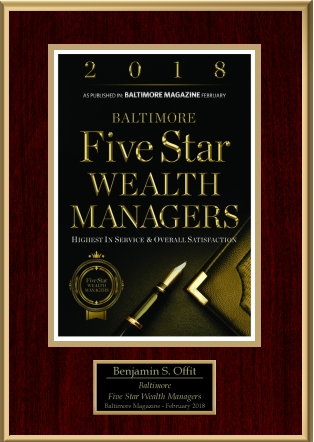 To receive the 2018 Five Star Wealth Manager award, researched and managed by Five Star Professional, a wealth manager must meet 10 objective eligibility and evaluation criteria associated with wealth managers who provide quality services to their clients. 1,759 wealth managers in the Baltimore area were considered for the award. 232 were named in 2018. Five Star Wealth Managers which represents less than 13% of the total wealth managers in the area. Wealth managers do not pay a fee to be considered or placed on the final list of 2018 Five Star Wealth Managers. The Five Star award is not indicative of the wealth manager's future performance. 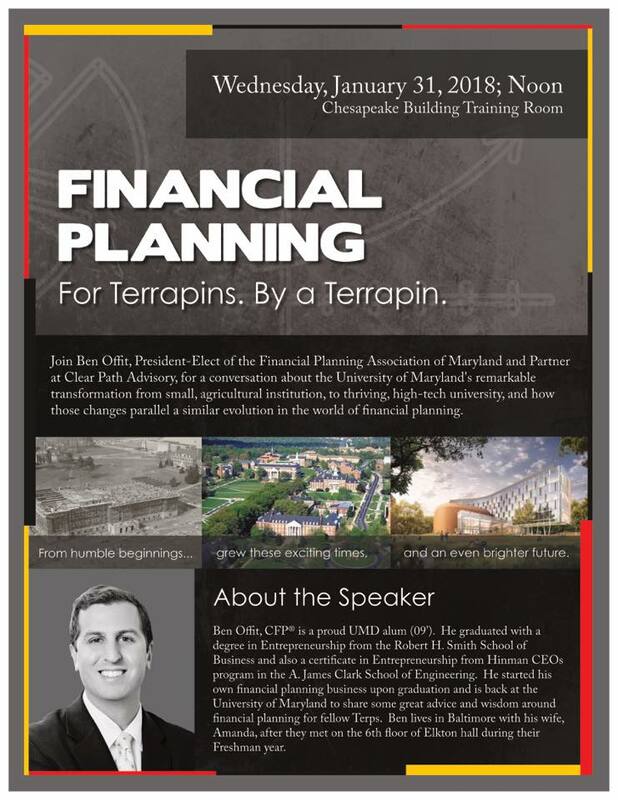 Ben will be speaking at his alma mater, the University of Maryland, on Tuesday January 31st, 2018 about the parallel progression of the University as well as the financial planning industry and how this applies when choosing a financial planner. Click the image above to see video. Many people ask me what they think the markets will do. I don't pretend to know what will happen tomorrow, next week, or the next year. My job is not to predict the markets, but more to put my clients in a successful position despite the ebbs and flows of the market. As history has shown us, there are inevitable temporary ups and downs in the market in the short term, but there is permanent advance in the long term. 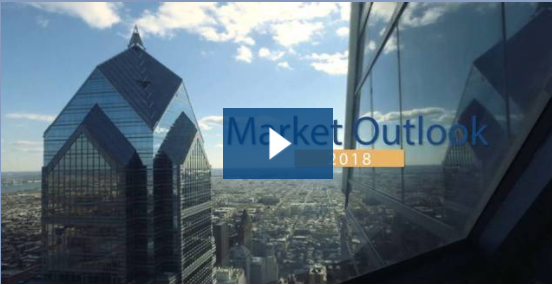 -The U.S. economy has accelerated over the past several quarters and they expect that economic momentum to carry into 2018. -Their view of the markets remains that we are still in the midst of a bull market for stocks. - They expect U.S. stocks to post mid to upper single-digit gains for the year, with a target of 2900 on the S&P 500. - However, they expect to see an upturn in volatility and a return of more normal market corrections, compared to 2017. If there were to be a form of a correction, it would occur around the mid-term elections. If this does occur, it typically sets the stage for strong rebound rallies. -They don’t see a recession on the horizon. And, if there is any correction, it should be shorter and shallower and set the market up for additional gains. Do you have an HSA with your health insurance plan and do you live in Maryland? If yes, you may want to think about your options, as HSA's have been outlawed in Maryland! HSA-qualified high deductible health insurance plans (HDHPs) are prohibited from covering any benefits before the deductible is met, except for IRS approved preventive care services. Therefore, it is impossible to purchase an HSA qualified health plan, since no exemption was made for HSA-qualified HDHPs in the Maryland law. The only way to reverse this law in Maryland is through legislative action. This has happened because in 2016 Maryland passed a law requiring all commercial health insurance plans to provide first-dollar coverage for male sterilization (i.e., no deductible, copays or coinsurance may apply). 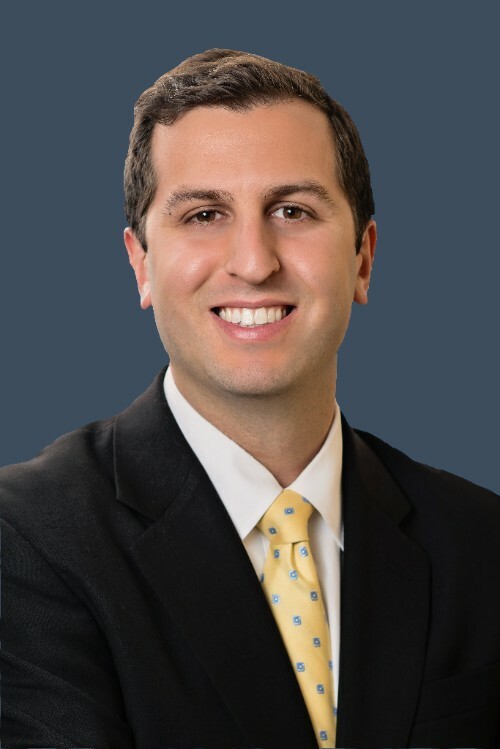 The law applies to all policies, contracts, and health benefit plans that are issued, delivered, or renewed in the State on or after January 1, 2018 except self-insured employer plans, which are exempt due to Federal ERISA law. It is possible, however, if you have an HSA plan that is with a company not based in Maryland, this will not apply. The first-year average gain for first-term presidents since 1928 has been 13%. Trump’s performance, as measured by the S&P 500, was up 23%. Obama’s first year saw the S&P gain 41%. January 17 is popularly thought to be the day when a large number of people abandon their New Year’s resolutions. The equivalent of 65 years of video are uploaded to YouTube each day. Roughly $1 billion in gift cards go unused every year.